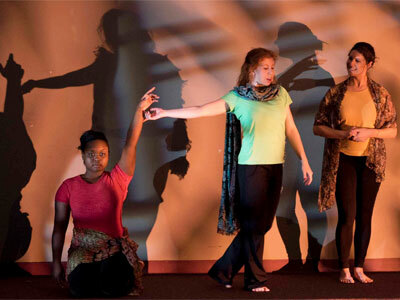 NIU School of Theatre and Dance students will remount their December production of “Women In To Light” at 2 p.m. Sunday, March 13, to benefit the DeKalb Area Women’s Center. 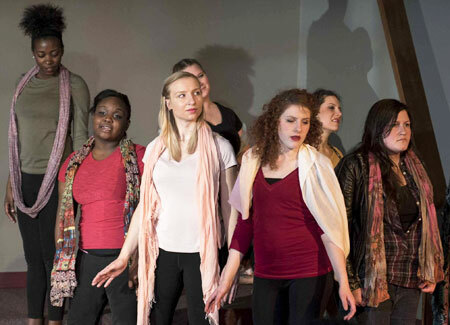 As a part of the center’s Women’s History Month programming, the NIU actresses will host a talk-back immediately following their performance to discuss their process of bringing the play to life. Director Kay Martinovich and the all-female cast created the drama from writings of women forgotten by history and popular culture. Each character presented uses dialogue taken directly from primary research materials such as first person narratives, poems, journals and autobiographies. The women’s stories center around a journalist who has been beaten, tortured and thrown in prison. While in prison, she meets women from throughout a history that spans the 10th century to the present – and whose voices have not been heard aloud until now. “The show has been such an incredible journey! We began the process of devising by research women who had been forgotten but who spoke to us,” Martinovich wrote in her director’s notes. Tickets are $5 – or, for that afternoon only, one Sacagawea golden coin or one Susan B. Anthony silver coin. The DAWC is located at 1021 State St. in DeKalb. For more information, all (815) 758-1351 or email dawc@niu.edu.